This week in 2007 the 3-game series between the Cleveland Indians and Los Angeles Angels of Anaheim, scheduled to be played at Jacobs Field April 10-12, was moved to Miller Park. The Indians had already started the season on the road against the Chicago White Sox, winning 2 of 3 games. When they came home to Cleveland, Mother Nature had plans that would interrupt their festivities and the next several games. The original Indians home opener was Friday, April 6, against the Seattle Mariners. The game was one out from becoming official before being cancelled by a snow storm. In fact, the Indians were leading 4-0 and had a no-hitter going to boot. The game was delayed at first before eventually being cancelled. It was scheduled to be made up the next day as part of a doubleheader, but snow and chilly temperatures again forced the games to be cancelled. Sunday and Monday also turned into doubleheaders as an attempt to get in the missed games. The idea was to no avail – the entire weekend and Monday passed without the Indians and Mariners taking the field to play. By Monday the upcoming three game series with the Los Angeles Angels of Anaheim looked like it could be lost to poor weather conditions as well. A big reason the games needed to be played was that the Angels were only scheduled to visit Cleveland once in 2007 for this series – so rescheduling the three games plus the snowed-out Mariners games would have been troublesome. Indians upper management had to act fast and their first thought was to select a neutral site for the series. St. Petersburg and Houston were considered at first, but logistically Milwaukee made the most sense. Finding available hotels for the players in the other cities was next to impossible, but wasn’t an issue in Milwaukee. The player’s collective bargaining agreement forbids travel from one coast to another without a day off. The Angels were due to play in Boston on Friday after the Indians series – and this killed the momentary thought that maybe the games could be played in Anaheim despite it not being a neutral site. 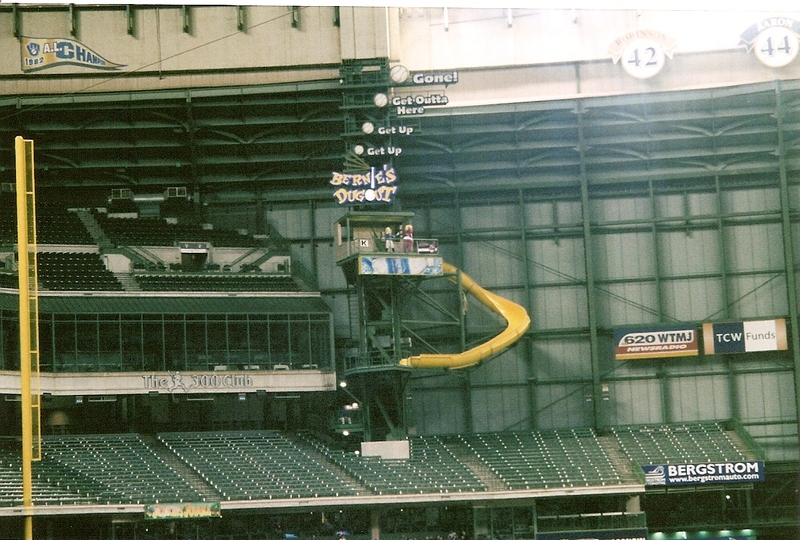 The Miller Park roof was the biggest selling point for moving the series to Milwaukee. Weather forecasts in the city called for highs in the low 40’s all week and snow on Wednesday. Knowing that all the games would be played despite the outside conditions was a huge factor for Milwaukee taking on the series. Of course it also helped the Brewers were on a road trip and wouldn’t return until April 19th. Even though the location was a great choice, the games were expected to go on as normal. For that it took the staff of Rick Schlesinger, the Brewers’ executive vice president of business operations, to step up and get things done quickly. Food for the concession stands needed to be ordered. The Brewers locker room had been left for their return home the following week and that needed to be quickly cleaned out so the Angels could use it for their team. Ushers, concession workers, parking attendants, clubhouse attendants, and a host of other workers had to be called in to staff the series. Indians fans that held tickets for the series in Cleveland were told they could either wait for news of when the lost series with Seattle would be rescheduled, and exchange tickets for those games. The other option was to exchange tickets for any other home game in the season. It had been three years since weather forced teams to shift to a neutral site. Montreal and Florida were forced to move their September, 2004, series due to Hurricane Ivan. They played two games at U.S. Cellular Field in Chicago. Tickets for the relocated series were just $10 – at the time this was less than the lowest Brewers seat price point – $16 for bleachers. Parking was $8 per vehicle. Tickets were sold for the lower level and loge, plus some bleacher seats were used as well. The initial goal was to sell roughly 9000-10,000 tickets for each game and fill the lower level of the stadium. These expectations were easily exceeded. Attendance was 52,496 for the three games. Many of the reports commented on how the crowds were a mix between Brewers and Indians fans, and just those wanting to see something different at Miller Park. A few Indians fans even drove the roughly seven hours from Cleveland to attend the series. Borowski was right about the home game atmosphere. Many baseball fans familiar with the movie Major League thought it was appropriate the Indians were playing home games in Milwaukee. Even though the movie was about the Indians, many of the game action shots were filmed in Milwaukee County Stadium. Brewers’ announcer Bob Uecker played the Indians announcer in the movie, and local extras filled the stands as Indians fans throughout filming. Ironically, the Major League “Wild Thing Edition” was released on DVD the first day of the Indians/Angels series. There were a number of nods to the film during the games, including “Wild Thing” being blasted over the speakers when Borowski came in to close for the Indians. The Indians mascot ‘Slider’ got to use Bernie’s Terrace and slide throughout the series. Slider hung ‘K’ signs off the terrace after each Indians pitcher recorded a strikeout. The Indians drummer since 1973, John Adams, was stationed in the right field bleachers to pound out a familiar beat. Adams had to get out of working his day job at a phone company in order to make the trip – one that the Indians front office wanted him to go on. The Indians also brought along their own at bat music for each player and videos normally played on the scoreboard at Jacobs Field. The Brewers Famous Racing Sausages ran their sixth inning race at all three games. Angels Traveling Secretary Tom Taylor and Communications Manager Eric Kay dressed in sausage mascot costumes to run in Miller Park’s famous sausage race in the bottom of the sixth inning during the Thursday game. Taylor was the hot dog and won the race and Kay came in second dressed as the bratwurst. Fans leaned toward cheering the Indians on like they were the true local team. They started a wave in top of the 7th inning of the first game, booed when the Indians Travis Hafner was called out on strikes, and booed Angels outfielder Gary Matthews Jr. Matthews may have been booed regardless of team affiliation because he was named in a human growth hormone scandal. It had been 10 years since American League only rules had been used at a game in Milwaukee. The last time was in 1997 which was Milwaukee’s final year in the AL – and they were still playing in County Stadium back then. To date, these have been the only AL ruled games at Miller Park. The Indians had visited Miller Park the year before, but lost all three games of an Interleague series against the Brewers. Tuesday and Wednesday were scheduled as night games with a 6:05 start time. Thursday was a day game with a 12:05 start. I’ve seen enough snow already for a year, maybe for a lifetime,” added Indians reliever Roberto Hernández. Indians won 7-6 with five RBI’s coming from Kelly Shoppach and Andy Marte, the number 8 and 9 hitters. Future Brewer C.C. Sabathia started for the Tribe and got the win, giving up 3 runs in 7 innings of work. “It felt good to just play,” Indians center fielder Grady Sizemore said. The Angels never trailed in this one, and went on to win 4-1. Future Brewer Francisco “K-Rod” Rodriguez picked up his fourth save and the Indians were limited to just four hits in the game. I was fortunate enough to attend game two. A good friend called right after the series was announced and asked if I’d like to go. We couldn’t pass up the opportunity to see something so unique in our home stadium. 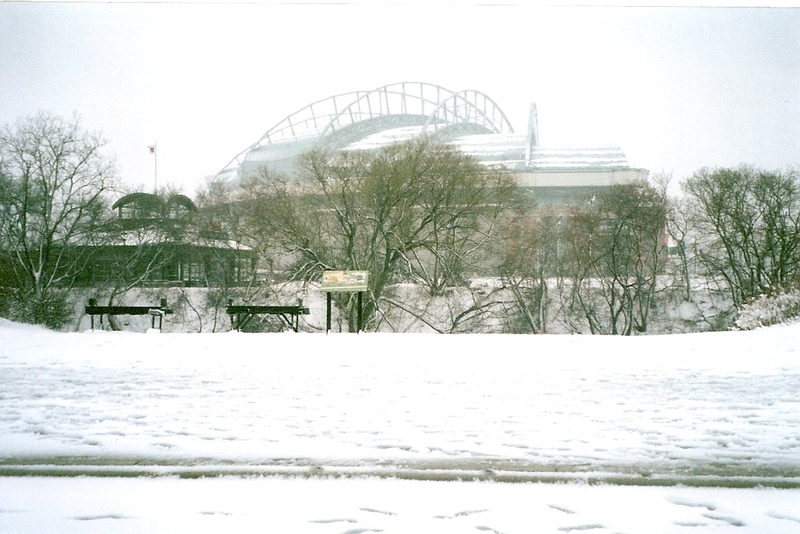 It did snow in Milwaukee that week, and made travel to game two a little challenging! We actually debated about going that day since the drive is about 1.5 hours, but decided to make a go of it and had a great time. The seats were great and we had an excellent view of the action. Little did we know that when we saw K-Rod close the game that he would be wearing a Brewers uniform a few years later. 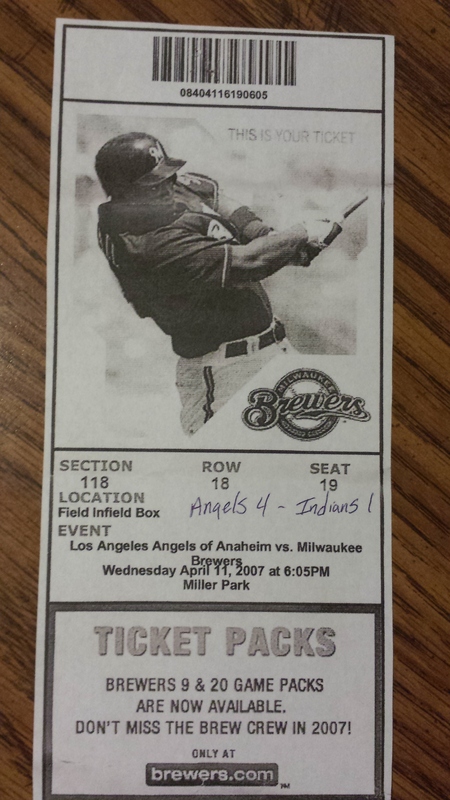 If you look closely at my ticket in the photo after this post, it shows the L.A. Angels vs. Milwaukee Brewers…oops! The fans weren’t the only ones who had a good time at the ballpark. Many players and coaches remarked after the game how well they were treated. Everything had been handled professionally as if the series had always been scheduled at Miller Park. The Indians did have a rough time making up the four game Mariners series that was cancelled. It was a logistical nightmare for both teams, with extra travel and off days being lost. Seattle came to Progressive Field in Cleveland on May 21, June 11, and August 30. The fourth game was added to the middle of a four game series in late September at Seattle, and became half of a doubleheader. In that game Cleveland was the home team and batted last. The true Indians home opener wound up being against the Chicago White Sox that Friday. The Indians went on to win the AL Central title that year and eventually lost to the Boston Red Sox in seven games for the right to go to the World Series. The Angels won the AL West division but also didn’t make it past the Red Sox in the playoffs. 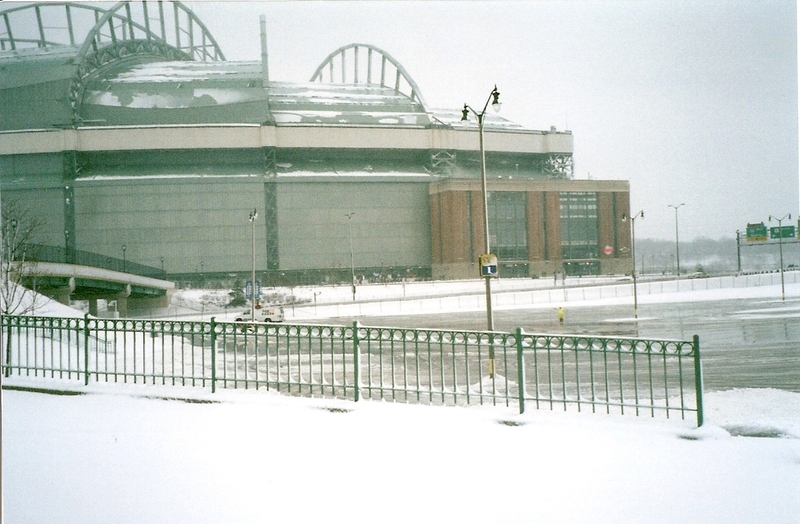 Snowy Miller Park. I took this photo as we walked in from the General parking lot. A good view of the April snow cover with Miller Park in the distance. Thank you for this article. Although I wasn’t at the game, I love the story, and how my home team worked hard to make this possible. Cheers! Thank you – glad you liked the story!